It is my job, as a parent, to raise and protect the children that God has given me. It goes beyond the obvious needs of food, clothing and shelter and into an even greater need of “Train(ing) a child in the way he should go, and when he is old he will not turn from it.” Proverbs 22:6. Raising a child involves love, discipline, education and looking out for their needs now, as it will affect them when they are old. If parents in America only provide for a child’s physical needs, forgetting to nurture the whole child, then American parents have done nothing more than what a wild animal does for its offspring. My work as a parent goes well beyond the obvious and must be intentional in training, raising, and nurturing them into moral, ethical and God-fearing adults who will in turn also raise a generation who live and do likewise. We are in a battle that represents more than just regaining the Congress with a Republican majority. This is about the America our children, grandchildren and great-grandchildren will inherit. It is waged for their future and for the hope that they will continue to live in a country that is still a shining light on the hill in contrast to all the nations of the earth that have been, are and will be. Freedom must always be guarded and battle lines must always be armed to defend freedom. When people become apathetic and lulled into a false sense of security, the enemies of freedom infiltrate and erode from within. The city on the hill has allowed the Trojan horse to enter the gates, yet because we know the story of the horse, we can destroy it, before it destroys the country that we love and cherish. America is awake and fighting mad. I pray that it is more than personal and that those who are showing up to the Tea Parties are doing so for this generation, the generation to follow and the one that came before. This fight can not be merely a selfish angst against health care reform, but rather a righteous indignation that America, bought with the blood of thousands of men and woman; can not, should not, be allowed to become like every the other nation in the history of the world. America was given the opportunity in the pages of history to be different, to not be like the European nations across the great Atlantic, but to strike out and begin a republic that would be a “new world….the asylum for the persecuted, lovers of civil and religious liberty from every Part of Europe. Hither have they fled, not from the tender embraces of the mother, but from the cruelty of the monster…..” (pg 139, Glenn Beck’s Common Sense) We must not allow the struggle of our Nation for a Republic Democracy in 1776, to become a wisp on the pages of history, but rather the defining government in all of history. We must not believe that the struggle ended with the surrender of Britain over two hundred years ago, but rather continues today through the diligent care of those who hold democracy in their hands: we the people. We the people are we the parents of the future of this nation. 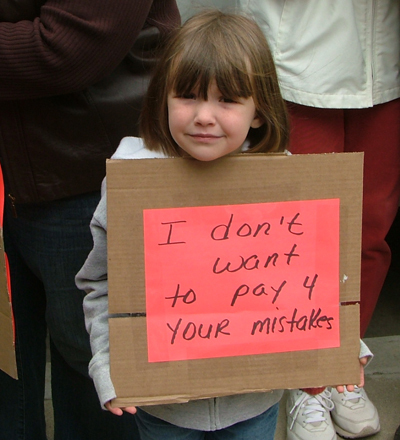 Our children depend upon us to stand up for their future rights by being involved in the process of our government. We are not governed, we are the government. However, if we allow ourselves to be controlled by those in Washington, instead of controlling them, then we have lost sight of what our job entails, and what their elected position requires. We can not be so busy living life that we forget to protect the very home that we will be leave to our children. We can not be so busy playing, that we forget our duty to provide for the future of our kids. We can not be so apathetic, that we are not diligent to train up our children, to feed our children and to protect them from those who don’t have their personal best interest at heart. The first institution in America was founded in 1636 by a Puritan named John Harvard. He left his library of 400 books to found a “seminary” with this understanding, “The maine end of [a student’s] life and studies is to know God and Jesus Christ, which is eternal life, John 17:3, and therefore to lay Christ in the bottome, as the only foundation of all found knowledge and learning.” (Samuel, Eliot Morison, The Founding of Harvard College). Today the mission statement for Harvard is vastly different. 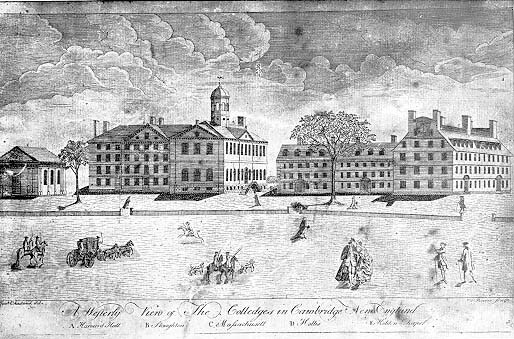 “In brief: Harvard strives to create knowledge, to open the minds of students to that knowledge, and to enable students to take best advantage of their educational opportunities.” Harvard no longer espouses that the study of God and Jesus Christ is the foundation of all found knowledge and learning, but rather there is a denial of God and the belief that humans can create knowledge. Education has devolved from its superior beginnings in America when the Progressive agenda took root, walking away from the classical preparation that made the true pursuit of knowledge and truth foundational and moving toward an education of experience, resulting in an incremental “dumbing down” of Americans dating back to the early twentieth century. Parents today may send their children off to prestigious learning institution, feeling secure in the campus security, the dorm life, and the extra-curricular activities these schools may offer, but because parent’s have also been indoctrinated into a Progressive mentality, it doesn’t occur to them to be wary of the propaganda taught at most universities. Glenn Beck points out in Common Sense that the educational system has “fallen prey to political patronage and the Progressive agenda.” Beck also quoted Woodrow Wilson, once president of Princeton University, (another one of America’s first colleges founded to meet the needs of training ministers) who said, “Our problem is not merely to help the students to adjust themselves to world life…. 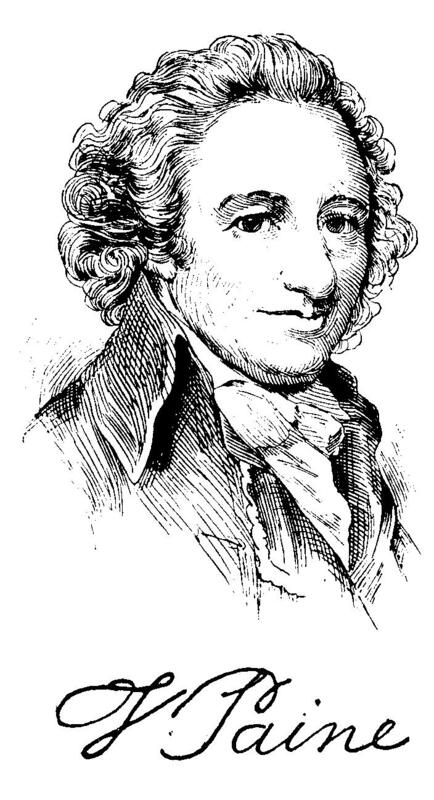 [but]to make them as unlike their fathers as we can.” Beck, Glenn Common Sense, Pg 91. When did the fathers of our country become unworthy of study and emulation? Who should we fashioning our lives after, if it is not the great men and women in history, our American history? Who should children view as worthwhile role models if it is not their fathers? When did the colleges and universities become enemies of the parent instead of a support system to help the child to succeed in becoming an adult? 17. Every student who, on trial, shall be able to translate from the original Latin text, and logically to explain the Holy Scriptures, both of the Old and New Testament, and shall also be thoroughly acquainted with the principles of natural and moral philosophy, and shall be blameless in life and character, and approved at public examination by the President and the Fellows of the College, may receive the first degree. 18. Every scholar who has maintained a good standing, and exhibited a written synopsis of logic, natural and moral philosophy, arithmetic and astronomy, and shall be prepared to defend a proposition or thesis; shall also be versed in the original languages, as aforesaid; and who carries with him a reputation for upright character and diligence in study, and shall pass successfully a public examination, shall be admitted to the second, or Master’s degree. Today according to the Harvard website, graduation requirements to earn the bachelor’s degree, a student must complete 128 credits and maintain good academic standing (2.0 GPA). At least 64 credits must be completed at Harvard University. A student must fulfill all of his or her requirements and be in good academic and financial standing with Harvard University, with no disciplinary or administrative procedures pending, to graduate and participate in May Commencement. Each school of study of course has differing requirements for its emphasis, but it is interesting to note the very different tone that one finds today at one of America’s most renowned universities and the requirements of two hundred years ago. Most interesting is the requirement that the student must be upright and blameless in life and character and having a thorough knowledge of the Bible in the 1700’s Laws and Statutes for Students of Harvard College. One would be hard pressed to find such a high standard for graduation from any school today, let alone America’s oldest institution of higher learning: Harvard University. Academic standards are set without regard for the character of the individual and no where is the Bible seen as an indispensable factor for a well rounded scholar. Our lower institutions of learning have an even tougher climb to reach the excellence of early American schools. 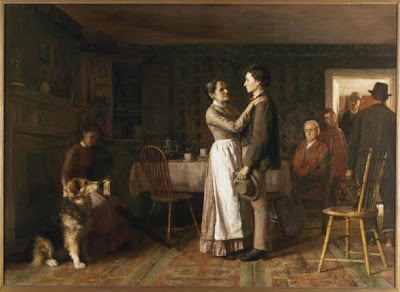 The New England Primer was the text book that emphasized both Christian character and literacy and classical education was a standard for many colonial Americans, along with apprenticeships to provide skilled training. 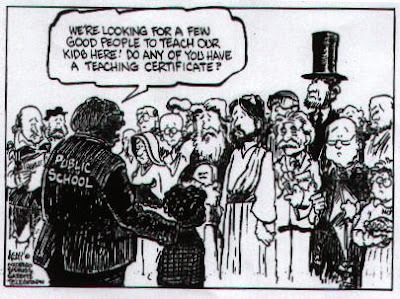 Today’s classrooms would not be allowed to have a New England Primer, as it would offend those who believe in the separation of church and state. The Primer utilized Bible stories to help teach the alphabet and the Westminster Catechism was also part of the text. Samuel Eliot Morison said, “American revolutionary leaders, both North and South, Madison, Wythe, and Jefferson, the Rutledges and Pinckneys, as well as Hamilton, Jay, and the Adamses, and Trumbulls, could never have rendered their distinguished services to the young republic without that classical leaning which is denied to most Americans today. (Samuel Eliot Morison, Three Centuries of Harvard (Cambridge, Mass. : Harvard University Press, 1936), 136. How do we expect our children to excel in grade school, middle school and high school when the standards of education are at an all time low? When Progressivism has a choke hold on real education, when indoctrination is the ring of the school bell, and the diploma of good citizenship is given to a student who can spew out the correct responses on a test that measures the ability to think green, distrust the government and treat people equally. We are not raising an army of brilliant thinkers as the founding fathers were, but rather a generation whose work ethic, morality and character are easy to mold by those who believe they know what is best. Yet this “knowing” leadership also attended the schools of Progressive instruction and they too are not in the same league as the excellent scholars, thinkers and statesmen that the Founders were. How can we as parents pursue an education for our children, that reflects excellence and strives for a standard that few achieve, a standard that early Americans set and achieved? We as parents do know what is best for our children, even in regard to education, though the local school district and the Obama Administration would say the contrary. American schools are failing our children not because students are not learning to read, write and do basic math, but because the standard of excellence, the standard of “blameless in life and character” is not the key element in a child’s life. When we take away the foundation of Biblical scholarship and morality and replace it with an ever changing ideology of humanism, then the goal becomes only to clone robots who espouse the philosophy of the powers that be. When high moral character and biblical ethics are separated from the education of a child, only the outer shell will appear polished. Test scores may reflect understanding and in academics that child may find success, but the inner person will struggle for meaning that was never addressed in this pursuit of knowledge. A wholly educated person is educated in mind, body and spirit and is a danger to the Progressive agenda, because that person has the ability to reason, to consider ethical ramifications and to speak against the wrongs that the government is foisting on the “tired and huddled masses”. This is why education is the most crucial weapon that we have as parents and that the Progressive desire to hold in complete control. There is recognition that if the masses can be educated just enough to know how to follow their “teachers”, then an army of “yes men” can be established. This is why parents must do their due diligence to be connected with their child through every part of schooling, even the choosing of the university. This too should becomes a family affair as the family releases the life, mind, and spirit of their child to an institution that will either reinforce the values of the family unit and build it into a stronger entity, or will do the work of a cancer and slowly destroy the value system of that individual, creating in that student an individual who questions the loving authority that nurtured it and instilling a group think mentality focused on experience and skills needed for a future society. 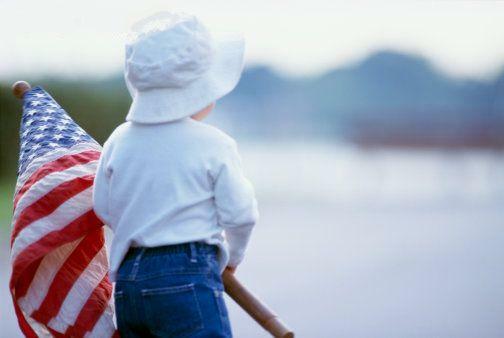 The future of America is in the children that we raise. Mediocre is not an option. Parents must become more deeply engaged in the philosophy of the educational process, as well as breaking the chains that have imprisoned our minds as well. We must re-educate ourselves, recognizing that we all have had a dose of Progressive indoctrination, and we must return to the educational pattern that helped establish this nation. Those who rule on high in Washington are products of this century old heist of the American mind. Like the old proverb, they too have been the frog, slowing dying in an ever warming pot of water. But the fire can be extinguished and the death of brilliant minds stopped. It is not too late to stop the march of this Statist ideology but it must become personal and we must return to the pursuit of truth that Harvard was built on at its inception: “The maine end of [a student’s] life and studies is to know God and Jesus Christ, which is eternal life, John 17:3, and therefore to lay Christ in the bottome, as the only foundation of all found knowledge and learning.” Without this foundation, we may truly say, the mind is a terrible thing to waste. Every student who, on trial, shall be able to translate from the original Latin text, and logically to explain the Holy Scriptures, both of the Old and New Testament, and shall also be thoroughly acquainted with the principles of natural and moral philosophy, and shall be blameless in life and character, and approved at public examination by the President and the Fellows of the College, may receive the first degree. Every scholar who has maintained a good standing, and exhibited a written synopsis of logic, natural and moral philosophy, arithmetic and astronomy, and shall be prepared to defend a proposition or thesis; shall also be versed in the original languages, as aforesaid; and who carries with him a reputation for upright character and diligence in study, and shall pass successfully a public examination, shall be admitted to the second, or Master’s degree. but it is interesting to note the very different tone that one finds today at one of America’s most renowned universities and the requirements of two hundred years ago. 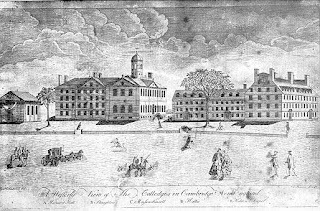 Most interesting is the requirement that the student must be upright and blameless in life and character and having a thorough knowledge of the Bible in the 1700’s Laws and Statutes for Students of Harvard College. One would be hard pressed to find such a high standard for graduation from any school today, let alone America’s oldest institution of higher learning: Harvard University. Academic standards are set without regard for the character of the individual and no where is the Bible seen as an indispensable factor for a well rounded scholar. er and literacy and classical education was a standard for many colonial Americans, along with apprenticeships to provide skilled training. ngland Primer, as it would offend those who believe in the separation of church and state. The Primer utilized Bible stories to help teach the alphabet and the Westminster Catechism was also part of the text. Samuel Eliot Morison said, “American revolutionary leaders, both North and South, Madison, Wythe, and Jefferson, the Rutledges and Pinckneys, as well as Hamilton, Jay, and the Adamses, and Trumbulls, could never have rendered their distinguished services to the young republic without that classical leaning which is denied to most Americans today. (Samuel Eliot Morison, Three Centuries of Harvard (Cambridge, Mass. : Harvard University Press, 1936), 136.